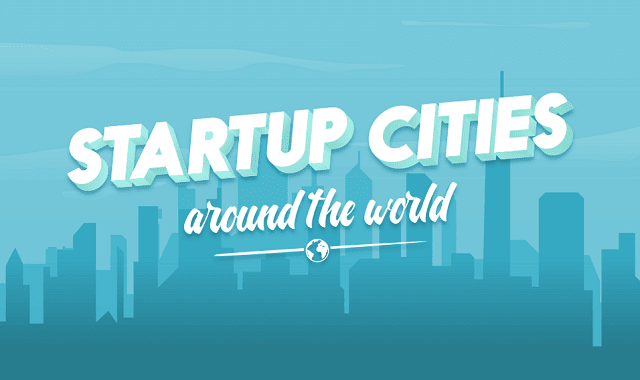 Top 8 cities for entrepreneurs around the world #Infographic ~ Visualistan '+g+"
With the rapid advancement of the tech industry and digital industries it has never been easier to start a new business. Government around the world have taken note of the economic gain for supporting startup companies, with many offering grands, tax breaks and incentives to boost the appeal of their local areas as great start up cities. This content is key to all business people in the world because it provides detailed information about tax breaks, grands and incentives offered by different governments to support new businesses. The study reveals that although London, Singapore and Vancouver offer the lowest corporate tax rate for startups, New York and San Francisco with higher taxes have the most companies registered with more than 40.000. Berlin is considered the prime hub for European companies and it offers very low cost living to the entrepreneurs who chose this city. The most expensive rent space is in New York City where new business can pay something close to 200 thousand pounds. Sydney, London and Vancouver follow the ranking. The UK governments is recognized for offering multiple incentives to new businesses such as grands and tax reductions as well as San Francisco that offers a 16-week program to connect government agencies with innovative startups offering more effective ways to use technology to benefit government. However, at the same time San Francisco offers the highest corporate tax rate. Singapore most famous startups as Money Samart Roomorama and Trade Gecko. Ayer Rajah Crescent is home to many co-working spaces, and there are numerous incubators located in this city such us Blk71 which is considered the hearth of the tech start-up ecosystem in Singapore. Sydney offers very interesting incentives like the Entrepreneurs Infrastructure program and that helps business financially and with networking. Design Crowd, Canva and Wipe Hero are one of the most recognized start-ups in this city. New York City has historically been famous for public and private investors due to the numerous incentives offered by the local government. Data reveals that New York attracts nearly twice the number of young female entrepreneurs as Silicon Valley. BuzzFeed Tumbler, Etsy are one of the most well-known startups. Amsterdam 25%, Singapore 17% and Vancouver 15% have the lowest corporate tax rates in the ranking. However, these cities are not as appealing as others because the government only in recent years have started to creating the incentives for this kind of business. They all offer financial assistance. No doubt the most famous startups have been born in California, Twitter, Facebook, Google and Apple are the startup flag from Silicon Valley. London is the house of Zoopla, ASOS, Citymapper and Tranferwise. Berlin has HelloFreh, Sound Cloud, Delivery Hero and Wooga. All these advantages should be considered for new business owners when considering where to start, some places are more receptive to specific business and offer better guaranties, but this information is worth to consider before, during and after the process of startups.